In this issue we bring the history of the peoples of Southern Russia to your attention. The study of the region’s ethno-confessional history and cultural diversity reveals very complex and contradictory patterns of interaction. Such research raises questions about the distinct features of the peoples inhabiting the region, but also about what these groups have in common, what that unites them on Russian soil, and what makes the region so significant in terms of its geopolitical position at a crossroads of civilizations. Separate chapters in the history of the peoples of Southern Russia deserve new attention, both from a new methodological standpoint and as a result of our expanding source base. The articles united in this issue focus on turning points and on the most tragic periods in Russia’s history, in particular the Civil War, the social and economic transformations of the 1920s and 1930s, and the Great Patriotic War. Historiography is a field where different and mutually exclusive interpretations can be discussed; this is particularly true when it comes to the relations between the Russians and the native peoples of the North Caucasus. We hope that the present contributions stimulate our scholarly discourse, and pave the way for a more nuanced picture of the region’s history. Particular pages of South Russia’s history are linked to the Cossacks, whose settlements on the banks of the Terek and the Don Rivers as well as in the Kuban and the Stavropol regions appeared as early as the 18th century. Kseniya Y. Sukhomlinova (Academy of Marketing and Social Information Technologies, Krasnodar) presents archival material on the measures that the Tsarist government and the Black Sea Cossack Host took to promote trade between the Cossacks and the mountain peoples of the North Caucasus in the first half of the 19th century. The author provides new data on the history of barter trade regulations as well as on the functions of exchange yards that existed in the region from the early 1800s to the mid-nineteenth century. The author describes the regulation of commodity exchange with reference to the prices of basic goods, and shows the pricing mechanisms used at the exchange yards over time. Lyudmila S. Gatagova (Institute of Russian History of the Russian Academy of Sciences, Moscow) analyses the complex and contradictory processes that unfolded in the region at the start of the Civil War. Using the works of Russian researchers and bringing in new archival materials, the author problematizes the ethnic factor in the Civil War and the ways it was employed by the opposing political forces in the North Caucasus. As the author argues, the ethnic matrix becomes the basis for the transformation of unresolved social problems into irreconcilable intergroup conflicts. Proceeding with the topic of the post-revolutionary history of Russia, Irina M. Fedina (Kuban State University, Krasnodar) studies how, in the first decade of Soviet power, the inhabitants of the Kuban villages looked at the agrarian transformations that the Bolsheviks introduced. In particular land and tax policies influenced the mood of the villagers, and impacted on the relations between the Cossacks and the newcomers during the land use reorganization campaign. On the basis of archival documents, Fedina discusses the social, economic, and cultural changes in the Kuban villages that led to the loss of that society’s Cossack features. The massive ideological campaigns of the Bolsheviks introduced a Soviet pattern of mentality into the consciousness of the Kuban population. Movla K. Osmaev (Chechen State University, Grozny) discusses the Soviets’ mobilization measures in Chechnya-Ingushetia during the Great Patriotic War. The author pays special attention to the evacuation of industrial enterprises and their subsequent restoration, as well as to the construction of a complex system of defense lines. The researcher shows the efficient mechanisms used to mobilize the human resources available in the republic for the dismantling of industrial enterprises for evacuation, and for the restoration of the oil industry. The article features statistical materials indicating the scale of mobilization in the ChechenIngush Autonomous Soviet Socialist Republic in the autumn and winter of 1942, and also the use of local conscripts to the labor army (trudarmeitsy) for work outside of the republic. According to the author, the decline of mobilization measures in 1944 can be explained by the deportation of the native peoples, resulting in the need to import labor force into the newly formed Grozny region. The joint article by Vardan E. Bagdasaryan (Moscow State Regional University) and Sergey I. Resnyansky (RUDN University, Moscow) is certainly the most provocative piece in the present collection. The two authors study the civilizational role of the Russian people in South Russia’s development through the lens of ethnic and demographic processes. On the basis of a wide range of statistical materials (including population censuses and reports from the Russian Empire, the USSR, and the Russian Federation), the authors illustrate the changing representation of ethnic Russians in the demographic structure of Southern Russia in relation to the respective titular nations. The authors put forward the controversial hypothesis that the civilizational peaks and valleys in the history of Russia over the past centuries can be correlated with the dynamics of Russian migration; the authors argue that a strong presence of Russians, as Russia’s ‘civilization-forming people’, pushes forward the development of the territories otherwise inhabited by non-Russian titular nations. From this perspective, the share of Russians in the demographic make-up, over time, indicates to what extent the region in question has been included into the Russian civilizational system. The authors conclude that ethnic and demographic processes must be managed to ensure Russia’s territorial integrity in the future. 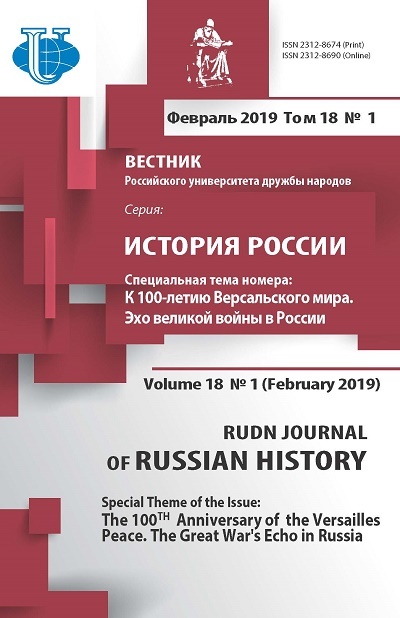 In their entirety, the publications of this thematic issue address a wide range of readers interested in the life of the peoples of Southern Russia, their interrelations at various stages of Russia’s history, and also the region’s prospects for development. The articles raise a number of important issues that deserve further discussion in academic publications. 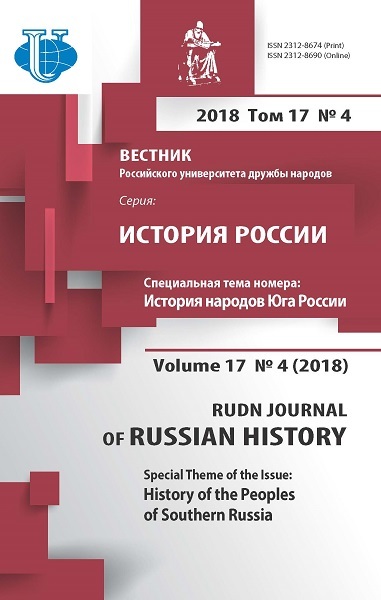 RUDN Journal of Russian History is meant to serve as such a platform also in the future. Copyright (c) 2018 Kemper M.